El Paso reliever Robinson Garces earned the win in this April 1990 game, according to The El Paso Times. He took over in the fifth inning and went four frames, giving up two runs and two for his first victory of the year, The Times wrote. 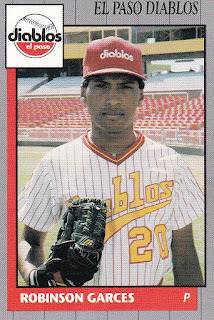 Garces went on to pick up one more relief win for El Paso that year and three more with single-A Beloit. Those wins were the final five of his career. He played seven seasons. He never made AAA. 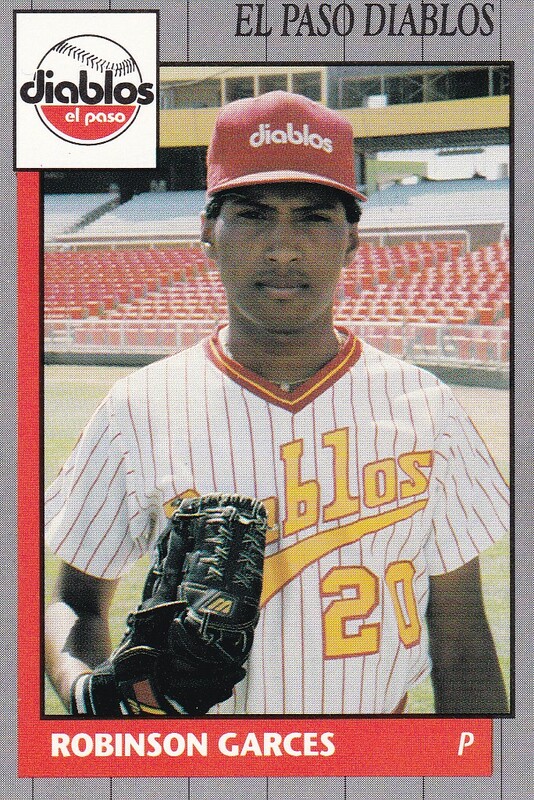 Garces' career began in 1984, signed by the Phillies out of his native Venezuela. Garces started with the Phillies in the rookie Gulf Coast League. He saw 17 relief outings and turned in a 1.01 ERA. He moved to single-A Clearwater for 1985 and then to the Tigers system and single-A Gastonia for 1986. At Gastonia, he went 21.1 innings without giving up a run and another stretch of 17 innings where he gave up a single hit. He ended with a 3.22 ERA. Garces played 1987 at single-A Lakeland and got four outings at AA Glens Falls, each of them starts. He went 3-1 at Glens Falls, with a 3.86 ERA. He then played 1988 between single-A Lakeland and Glens Falls. He went 8-6, with a 2.81 ERA between them. Then, at the end of August 1988, Garces was traded with Chris Hoiles and Cesar Mejia to the Orioles for Fred Lynn. He played 1989 at AA Hagerstown. He went 1-6, with a 3.47 ERA over 32 outings, four starts. He arrived with the Brewers for 1990, playing at El Paso and Beloit. He went 5-6 on the year and had a 3.19 ERA to end his career. Garces went on to serve as a scout. He's credit as working with the Red Sox in 2001 and the Blue Jays in 2010.